Not many professors stumble upon entirely new compounds in the course of their research but for Dr. Benny Chan, these “serendipitous discoveries,” as he likes to call them, are just part of being a materials chemist. Dr. Chan joined the faculty at TCNJ in 2006 after a one-year visiting professorship at Dickinson College. He attended Franklin and Marshall for his B.A. in Chemistry and, after a brief stint as a quality control chemist with Merck, went on to receive his Ph.D. at Pennsylvania State University. Following his doctoral degree, he completed a post-doctoral position at Colorado State University and Los Alamos National Laboratories. “I’ve always had an interest in teaching because of my great experience at F&M but working at Dickinson sealed my decision to stay at an undergraduate, liberal arts institution,” he said. As a materials chemist, Dr. Chan focuses on the applied side of chemistry by making new materials with specific applications. In a nutshell, he chooses the application first and then looks for new compounds that may have the properties for those applications. Of particular interest are superconductors, which have the ability to conduct electricity with zero resistance, and thermoelectric materials, which can be used either in collecting waste heat to generate electricity or in cooling applications. These interests overlap because he uses similar synthetic strategies for both projects. When it comes to magnetic materials, Dr. Chan attempts to synthesize analogs of known superconductors – materials that have zero resistance once they drop below a certain critical temperature, in the hopes of discovering new superconductors closer to room temperature. Real-world applications for superconductors include high efficiency transfer of electricity along with nuclear magnetic resonance (NMR) and magnetic resonance imaging (MRI) medical instrumentation. Throughout his research, Dr. Chan has made ample use of the single-crystal X-ray diffractometer awarded by a National Science Foundation grant last year. 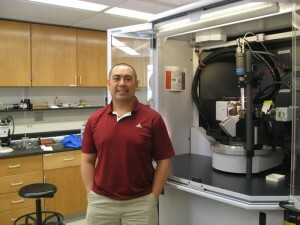 To date, the Chemistry Department has partnered with Princeton University, University of North Carolina-Ashville, and Messiah College, along with several faculty members including Dr. David Hunt, Dr. Heba Abourahma, and Dr. Abby O’Connor in utilizing the instrument, which is a key component of research in synthetic organic and inorganic chemistry.